2 Star Michelin Restaurants – Seriously – are they worth the price? Hard to say actually. 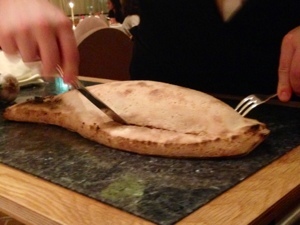 We only ate at two 2-star restaurants this trip – the fabulous Atelier in Munich has only 1 star. The first was the Essigbratlein in Nuremberg, the 2nd was the Fischers Fritz in Berlin. Both are seriously expensive, very elegant, service intensive restaurants – both are clearly intended to offer ‘blow-you-away’ food at prices that will dent your pocketbook. First – the Essigbratlein. Nuremberg is not Berlin, and one wouldn’t expect either Berlin prices, nor Berlin quality – and you’d be exactly right. The meal at the Essigbratlein – a tiny 10 table hole-in-the-wall located within spitting distance of the Nuremberg Castle – was good – heavy on veggies (unusual in restaurants of this type) – and generous with the wine. But the courses blur together in my memory – delicious why we enjoyed them, but except for the Brussel sprouts with mandarin – not worth blogging about. The one exception were the Brussel sprouts. Not a vegetable I would quickly assume I would enjoy – and in this case – I’d be very wrong. This was a stunning dish. Light, flavorful, full of texture – completely delicious. And I must compliment the restaurant on the wine service. Traditionally – I don’t order the wine pairing – it’s a lot of money for a lot of alcohol I simply can’t drink. But at the Essigbratlein they went ahead and poured me a sipping portion of each wine served at the table. I could taste, enjoy – and they didn’t charge us. Cool. Second – the Fischers Fritz. This is a much larger restaurant – more servers, more tables, more space. And located as it is in the Regency Hotel in Berlin, I’m going to guess a much much larger kitchen. The result is as should be expected – a superior experience. 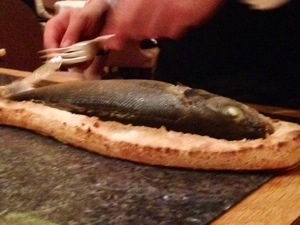 Highlights included the Sea Bass in Sel (an entire fish cooked in a flour/salt pastry shell so that the juices are sealed in), and the Cheese Course. I adore a cheese trolley – and their trolley was outstanding. On the other hand – they did not accompany the cheese with as many treats as did the Atelier in Munich – so I can only give them a B+ for that course. 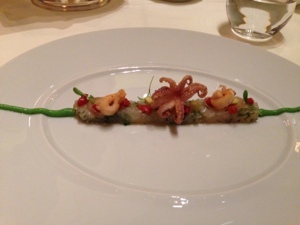 I also loved the first appetizer – a tartare of sea bass with avocado and quickly fried mini-octopus. Wonderful texture, delightful favors, plus it looked great. Unfortunately – the desert was a disaster – I think the Fishers Fritz needs a pastry chef – bad! The ‘franchise’ on the other hand were delightful tiny bites of chocolate truffles, jellies, and treats. They were as good as the desert was bad. I must admit that while the Fischers Fritz was the better of the two, the Atelier in Munich trumped them both. Oh well – you never know if you never try!